Vijay Krishna Acharya's Thugs Of Hindostan couldn't have got a better start at the box office as the film has managed to collect a whopping sum of Rs 81.50 crore (adding the business of Tamil and Telugu releases) within two days of its release, reports Bollywood trade analyst Taran Adarsh. However, the film's performance witnessed a dip in its performance on Friday as it managed to collect Rs 28.25 crore. According to Mr Adarsh, the film needs to perform well on Saturday as well as Sunday in order to keep its performance at the box office intact. Mr Adarsh tweeted: "Thugs Of Hindostan has to show a positive upturn on Day 3 [today], else its sustainability from Day 5 [Mon] onwards will be extremely doubtful...One thing is crystal clear. Thugs Of Hindostan has not met the monumental expectations...The BO numbers are doing the talking now." 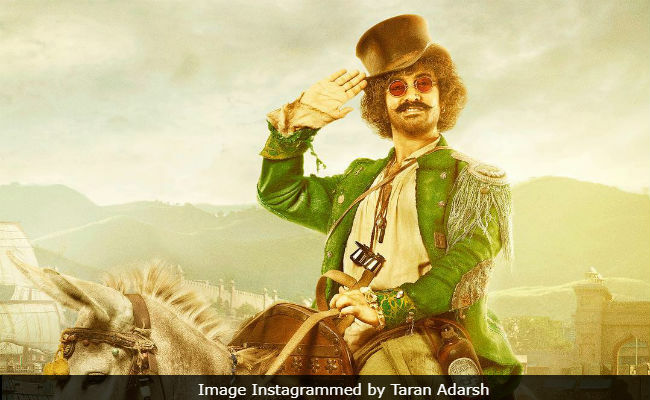 #ThugsOfHindostan has to show a positive upturn on Day 3 [today], else its sustainability from Day 5 [Mon] onwards will be extremely doubtful... One thing is crystal clear: #TOH has NOT met the monumental expectations... The BO numbers are doing the talking now. In a separate tweet, Taran Adarsh attributed the film's success at the box office to its impressive performance on single screens. Thugs Of Hindostan slips on Day 2, facing a fall during #Diwali holidays... Mass belt / single screens are holding better, but the cracks are already showing at multiplexes," read an excerpt from Taran Adarsh's tweet. Thugs Of Hindostanopened to largely poor reviews, but that did not affect the film's performance at the box office. In his review for NDTV, film critic Saibal Chatterjee gave the film two-and-a-half stars out of five and wrote: "Thugs of Hindostan might entertain large swathes of the audience, but it is ultimately too tacky and unconvincing to lay legitimate claims to being India's answer to Pirates of the Caribbean. It isn't even a poor copy." Thugs Of Hindostan is a high-octane action film directed by Vijay Krishn Acharya and it has been produced by Yash Raj Films. Besides Aamir Khan, the film also stars Amitabh Bachchan , Katrina Kaif and Dangal actress Fatima Sana Shaikh.